We will meet you at Palermo International Airport in the early afternoon. Our well-equipped touring bus will take us to Menfi, in the province of Agrigento, at the beautiful Foresteria Planeta Estate, producer of some of Sicily’s best wines. We will have this estate all to ourselves, as there are only 14 rooms on the property! Get acquainted with your fellow tour members over some Planeta wines and enjoy the magnificent views. We will follow with a traditional dinner in the estate’s restaurant featuring some local specialties. During the meal we will discuss what to expect in the coming days of our tour and answer all your questions. The day starts with a leisurely homemade breakfast. Later in the morning we will prepare Sicilian specialties at Planeta’s cooking school kitchen and enjoy the dishes for lunch. In the afternoon we will visit the vast archaeological site of Selinunte, founded c. 650 bc and renowned for its well-preserved temples on the eastern hill and for its acropolis. Late in the afternoon we’ll drive to Castelvetrano to tour an organic olive oil estate, where we will learn about the farm, their methods of cultivation and taste their olive oil. We’ll dine at this olive oil estate on local specialties featuring their amazing extra virgin olive oil. After breakfast, we’ll travel to the Via Del Sale, the road between Trapani and Marsala, to tour the Saline Ettore e Infersa saltworks, where they still practice the ancient tradition of harvesting salt from the sea. On the way we will stop to visit the majestic Doric temple in the abandoned ancient city of Segesta. We will head to Marsala and visit one of the premier wineries in the area, Donna Fugata, where we will enjoy a wine tasting and lunch featuring local specialties. Later in the afternoon we will be the guests of Florio, the oldest Marsala winery that dates back to 1832. We will learn the history of Marsala and conclude with a tasting of their Marsala and passito. We will head back to Porto Palo to enjoy a dinner of Sicilian specialties at a seaside restaurant. We will have an early breakfast so we can watch a local shepherd make ricotta. We will taste it fresh as it is made and then bring some back with us to use in our cooking class. There we will work with the chef to prepare local dishes for our lunch. In the afternoon you have the option to relax and enjoy the pool or visit a local organic winery to taste wines made with indigenous grape varieties of Sicily. Our last night in Menfi will end with a winemaker’s dinner at Foresteria Planeta Estate. After packing our bags we will enjoy our last breakfast at Planeta Foresteria and drive to Erice, a medieval town perched on a hilltop at 2,000 feet with sweeping views of the western Mediterranean Sea. We will spend the entire day in Erice. We’ll meet Maria Grammatico at her new cooking school where she will guide us through making our lunch featuring both savory dishes and some of her famous pastries. Maria was the subject of the book "Bitter Almonds: Recollections and Recipes from a Sicilian Girlhood" by Mary Taylor Simeti. The book recounts the story of how, as a child, Grammatico lived in a cloistered orphanage in Erice and learned the techniques of making the beautifully handcrafted pastries that she will demonstrate. Afterwards, we will explore the town of Erice with our own private guide. Then it is on to Palermo, where we will check into our hotel right in the center of the historic district. We’ll enjoy an evening concert at the fabulous Teatro Massimo opera house if available, if not you will have free time to explore the city at night. In the morning we will start our tour of Palermo with a private guide and walk to see key cultural sites of Palermo, including the Cathedral, the Palatine Chapel, the beautiful Piazza Bellini and the Quattro Canti (the Four Corners) of the city. We will stop for lunch and have traditional Sicilian street food such as Panelle e Crocchè and Sfincione. 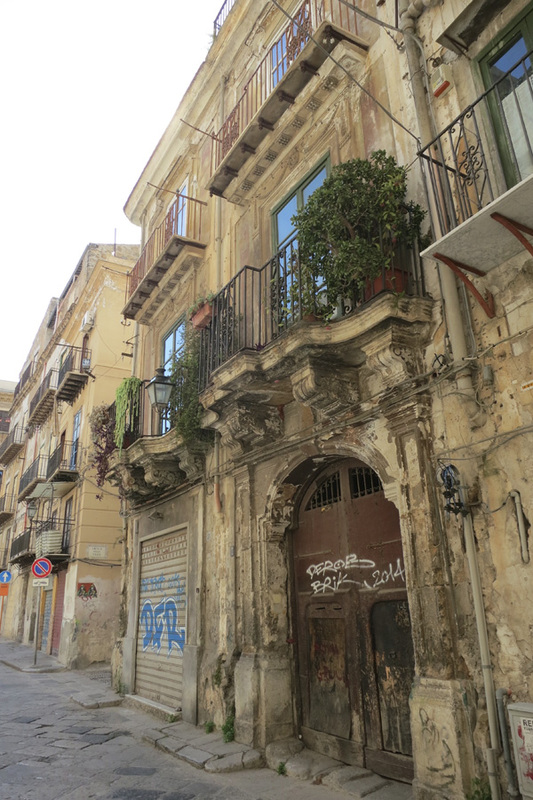 We will continue exploring Palermo and have some time to shop along the way. Dinner at a local pizzeria. After breakfast we will walk to Palermo’s colorful food market. You will recognize the Arabic origins of Sicily reflected in the market, which somewhat resembles a bazaar. In the late morning we will visit Monreale, a pearl of Arab Norman art. Built in 1166, the Cathedral of Monreale is covered with unique mosaic work on the walls and ceiling representing Biblical stories. Lunch at a local restaurant in Monreale. On our way back to Palermo, we will stop at our favorite pasticceria to enjoy a Sicilian sweet or a brioche filled with Sicilian gelato. In the afternoon you will have some free time to complete your last minute shopping before we go out for our farewell dinner. After breakfast, the shuttle takes you to the Palermo International Airport for your return flight. We should have you back at the airport by 10 am.